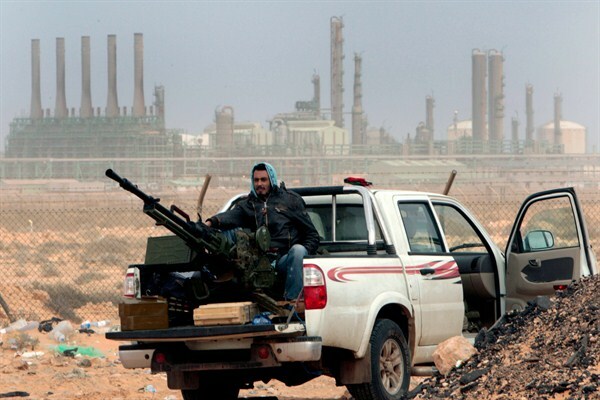 An anti-government rebel sits with an anti-aircraft weapon in front an oil refinery, Ras Lanouf, Libya, March 5, 2011 (AP photo by Hussein Malla). Libya’s crude oil production has increased by more than 70 percent since August, to 450,000 barrels per day, as several oil fields resumed output and the port of Ras Lanuf reopened for the first time since 2014. In an email interview, Matthew Reed, the vice president of Foreign Reports, Inc., a Washington-based consulting firm focused on Middle East politics and world oil markets, discusses Libya’s oil industry.